Compact and easy to install, this portable induction loop system readily accommodates individuals with hearing difficulties--at a bank teller window, information desk, store counter or anywhere customers/visitors need to hear what is being said. Hearing HotSpot picks up external voices with an integrated microphone or with an optional external microphone. The system transmits the spoken word directly and clearly to a listener’s hearing aid equipped with a T-coil. Designed to meet ADA accessibility requirements. 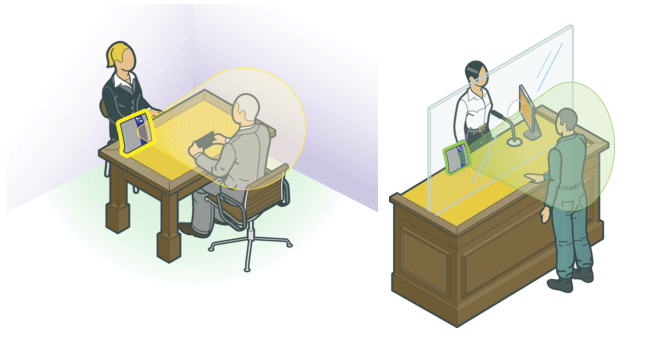 The Williams Sound Hearing HotSpot shall be housed in a plastic enclosure and can be placed on a service desk or mounted onto a wall or under a counter. It shall have a range of 3 – 4ft and work with T-coil equipped hearing aids. The Hearing HotSpot shall have a built-in 12VDC rechargeable battery pack that will last up to 6 hours when given a full 3 hour charge. It shall be able to operate off AC power through the same battery charger. It shall have a built-in microphone on the back of the unit and have an additional 3.5mm phone jack for optional external electret microphone. There shall be a gain control for adjusting the external microphone input. There shall be indicator LED’s for power on, battery charging and input signal to the induction loop. The Hearing HotSpot shall be covered by a two-year parts and labor warranty. 90 days on accessories. This shall be the Williams Sound model Hearing HotSpot. Rotary microphone gain for external mic. Compact and easy to use, the Williams Sound counter loop readily accommodates individuals with hearing difficulties. The counter loop system picks up a person's voice from the rear integrated microphone (or an external microphone can be used) and transmits the speaker’s words directly and clearly to a listener’s hearing aid equipped with a T-coil. The listener can pick up the audio when they are within four feet of the counter loop system. This technology allows private conversation while maintaining moderate voice levels.